Crystal's Crazy Combos: Grassy Nails the New Trend? Take the textured nail trend to new heights! Emphasize the beauty of your natural nail with the latest product innovation by Zoya -Grassy Nail! The all natural formula* gives you a luscious textured finish that's easy to achieve.The introductory four piece set includes everything you need to get growing, but hurry - this Limited Available set is only available WHILE SUPPLIES LAST! more about the simple six-step process for long, luscious Grassy Nails! 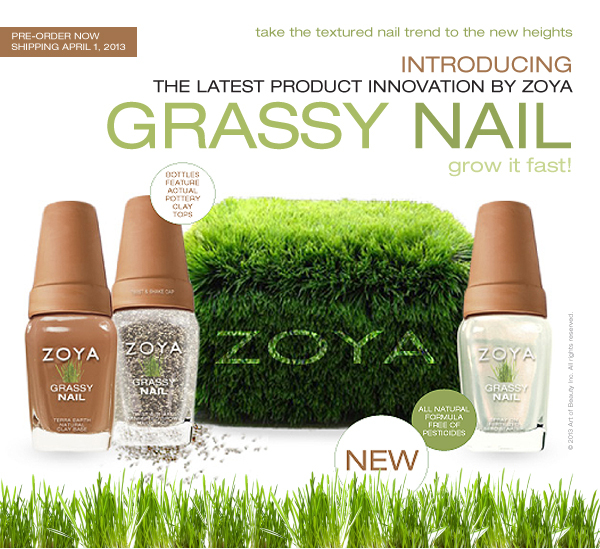 *Grassy Nail by Zoya products are all natural, free of pesticides and vegan-friendly! That is freaking weird and doesn't even look good!